Sabina, originally uploaded by Ringo Fuentes. 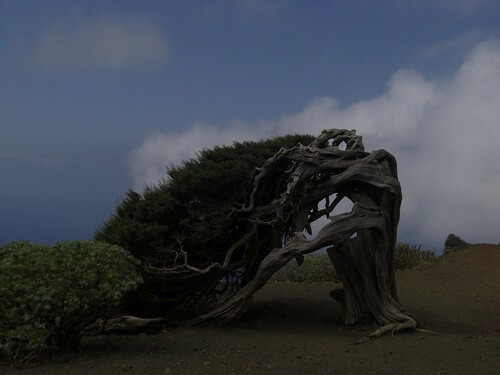 This ancient Phoenicean Juniper is a famous tree on the Spanish island of "El Hierro" (name means Iron). The word Sabina is Spanish for Juniper. This tree is the most well known of many Juniper trees on the island that have been deformed by the constant wind. According to the locals there used to be large numbers of Junipers on the Island but because their wood was prized for making tables, stools, torches etc they were cut down and used until only the most deformed ones were left. These were not cut because their shape made them not very usable.